This article first appeared in City & Country, The Edge Malaysia Weekly, on May 1, 2017 - May 07, 2017. DATUK Ng Thien Phing has found success at a young age. Yet, one is more likely to find him sipping coffee at a kopitiam, chatting to “uncles” and “aunties” than hobnobbing with friends on the golf course. In fact, the founder and group managing director of SkyWorld Development Sdn Bhd had to be convinced by his team to be in the public eye more often. He did not come from a privileged background. Growing up, his family of five lived in a rented one-bedroom kampung house in Kuala Krai, Kelantan. “My father was a hard-working lorry driver and my mom, a modest homemaker. I am the eldest and only son,” Ng says. When he was a young boy, he used to get upset at his mother for turning down his requests to buy new toys. The family eventually bought a house for RM25,000 and that was when Ng realised the importance of a house. In 1996, Ng landed his first job as a conference producer in one of the largest corporate training providers in Malaysia. Then came the Asian financial crisis in 1997 and at age 22, Ng found himself out of work, which, on hindsight, turned out to be a good thing for him. “I decided then to set up my first company, NTP World Forum. Within three years, my company became the largest training provider in Malaysia. I was so pleased to receive a written recognition of our achievement from the [then] human resources minister,” he says. Yet, despite his success, he realised his heart belonged elsewhere. “Since I was young, I have always wanted to be in the property industry. This is partly because my mum has taught me the importance of owning a home as it took us great efforts to get one. I did some research and found that everyone spends 30% to 40% of their income on their properties,” Ng recalls. In 2008, he took a chance and started his journey into property development and has not looked back since. To some, it may seem like SkyWorld came on the property scene out of nowhere. That could not be further from the truth. Ng took his time building the foundation of the company before launching its first project — Ascenda Residences @ SkyArena, Setapak, in October 2014. 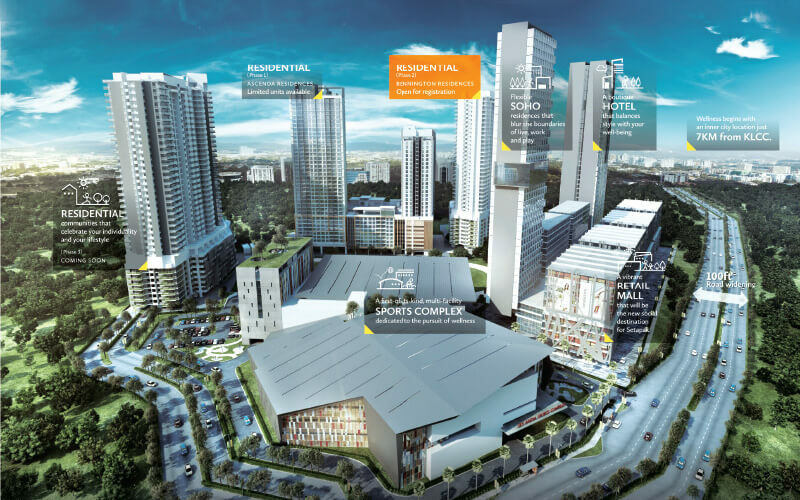 The development comprises 650 condominium units and has a gross development value (GDV) of RM399 million. It is 96% sold. At the top of Ng’s agenda was finding the right talent and land. “As a firm believer in getting the right people, doing the right thing at the right place and time, my team and I took six years to set up the management team. We had a strong pool of talent. We began actively ­exploring quality land in Kuala Lumpur. “We did thorough research and came to the conclusion that the winning formula is location, location and location. Hence, we decided to focus on land in KL and positioned ourselves as a city developer,” Ng says. He spent, and still spends, a lot of time driving all over KL to find good land. Talent is of particular importance to Ng. “I’m always on the lookout for talent. We currently have about 140 staff and expect to increase the number to 200 by year end. “I interview every applicant for managerial positions and above because it is important that we hire people who can add value to the company’s work culture and have leadership quality. My goal is to build a professional team that will one day take over the management of the company,” he says, adding that 55% of his staff are Gen Y. Apart from Ascenda Residences, SkyWorld has launched five other projects to good response. The six projects have a total GDV of over RM1.9 billion. “My strategy is to focus on becoming a KL city developer. We want to transform the city skyline. There are two parts to our tagline of ‘transforming cities’ — the hardware, which is innovative design, and the software, which is the sky living experience,” Ng says. To him, sky living experience means harmonious living, reminiscing of kampung life with abundance of facilities, amenities, Green Building Index-compliant and city farming. Through market research, Ng and his team have become well-acquainted with what consumers want, and work to deliver value for money. He believes that the strong emphasis on SkyWorld’s three key strengths will give it the edge in marketing its products. Its first strength is value creation, which looks at location and quality (by adopting Conquas and Qlassic standards), giving its developments good potential for capital appreciation. Conquas is the acronym for construction quality assessment system and Qlassic is for quality assessment system in construction. These systems measure and evaluate the workmanship quality of completed projects. “Second is integrated sky living and, last but not least, is innovative designs and concepts. This means practical layouts such as big lanais for family gatherings, storeroom next to the car park and so on,” Ng says. The years of hard work that Ng and his team have put in to lay the foundation for the company are starting to bear fruit. Ng believes that the company’s innovative products and ability to give customers what they want have helped build its customers’ confidence. “I always tell my staff that it’s always customer first and it is all about the customers’ experience. We realised that we were able to create products that suit their needs, especially Gen Y’s. What they want, we give it to them. “We knew we didn’t want to be like other companies that create what they want, then ask the market what it wants. We do thorough research. I go to coffee shops and ask people what they want ... I talk to my wife. I think it’s important to ask,” Ng says. The team is expected to adhere to the Qlassic and Conquas quality standards. However, Ng realises that the local market does not really understand quality. Before a project is launched, SkyWorld will conduct a feasibility study. Coupled with the dedication of the team and support from its business associates, the developer is able to craft a good product mix and give what the market wants, Ng says. He always challenges his staff, pushing them to come up with innovative products. Each department has its own set of key performance indicators (KPI). For example, one of the teams is to meet the KPI of the FIABCI (International Real Estate Federation) quality because to Ng, that is the gold standard. It is also crucial to him to keep the prices reasonable. “Some people have told me that I can set my prices for some projects higher at RM1,000 psf. But our focus is on the community. My advisers say, ‘Let people make money, then they will keep on supporting you’. “People buy a property today priced at RM500,000 and expect the price to be higher tomorrow. We want to keep the price at RM500 to RM600 psf, where everyone is comfortable with. Of course, we also need to hit some figures. We are trying to balance that. That’s why the staff are always mad at me, they said I always want not only good but also cheap products,” Ng laughs. He assures that SkyWorld is constantly looking at its product mix, which emphasises quality sky living experience, value creation and innovation. 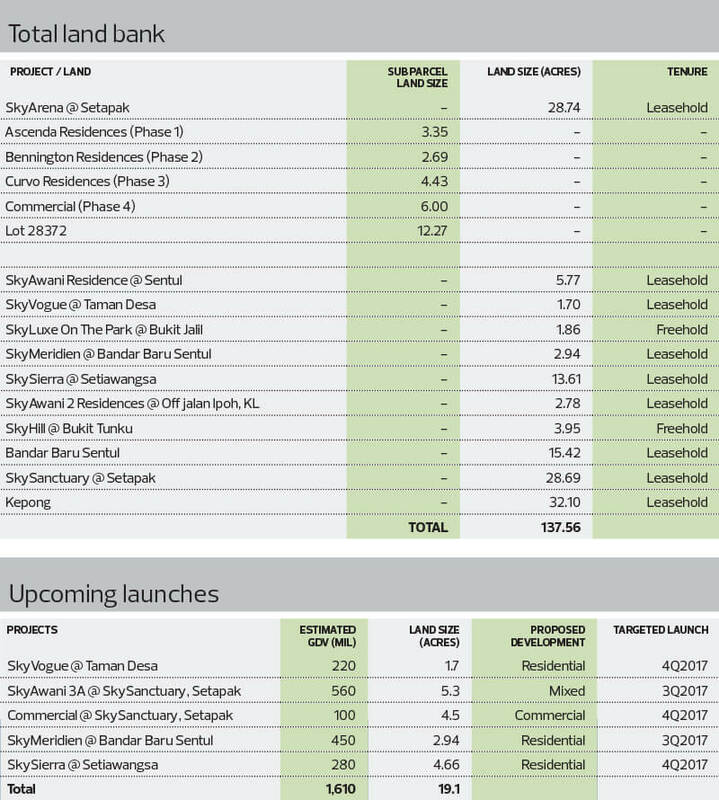 SkyWorld plans to launch four to five projects this year with an estimated GDV of RM1.6 billion. It currently has a land bank of more than 130 acres in KL with an estimated GDV of RM13 billion. “Our land bank is funded primarily through equity and debt financing with an element of deferred payment,” Ng says. Among the new launches are SkyVogue @ Taman Desa, a residential development with an estimated GDV of RM220 million and SkyAwani 3A @ SkySanctuary, Setapak, a mixed-use development with an estimated GDV of RM560 million. While many developers have or are planning to venture into other states, Ng is adamant about staying in KL. In the long term, Ng plans to undertake an initial public offering in the next two to three years to enhance the company’s financial position. “We will only focus on property development in KL in the foreseeable future. However, after 2020, should there be good investment opportunities outside KL or overseas, we will consider. “Through the years, we have had access to good land in Selangor (Petaling Jaya), Johor (Johor Baru) and Penang. We decided to stay focused in KL. Good or bad times, if the location is strategic and near KL city, the project will be marketable,” he says. He expects this year to be challenging due to the upcoming general election, post-US presidential election and Brexit. “However, we believe there will still be pockets of opportunities for property developers. There is still demand for properties with good accessibility and attractive pricing, particularly in KL,” Ng says. Despite his subdued outlook, Ng believes SkyWorld has the right product mix to appeal to the broader market. Ng says SkyWorld’s target market is mainly young executives, young families and upgraders around the neighbourhood. “Given all our projects are in KL, we would like to think we complement the bigger property developers as we are building integrated city developments, not big townships,” he adds.